earlier this week, and the article is now up for your reading pleasure. So if you're worried about Giant Rocks from Space, where should you live? A group of researchers led by Nick Bailey of the University of Southampton have studied the problem. They've come up with a global analysis of what places are most at risk from asteroid impacts. Obviously, if you're directly under the asteroid when it hits, you're vapor. But if you're outside the immediate impact zone, your biggest worry is tsunamis. Since Earth's surface has lots of ocean, an asteroid strike can create dangerous waves which can cause a lot of destruction at great distances from the actual impact site. So who's most at risk? Countries with lots of people and infrastructure in low-lying coastal areas: China, India, Indonesia, Japan, and the United States are the big candidates for massive population loss. In terms of material damage it's the USA, China, Sweden, Canada, and Japan. Australia, despite having a lot of coastline, is suprisingly low on the risk scale -- perhaps because there are large reefs and island chains protecting its shores. Africa, with its steep and harbor-poor coasts is also quite safe. The deserts of Central Asia are naturally tsunami-resistant. Here's a suggestion: I think we should require any SPACEGUARD-type organization to be headquartered in a highly vulnerable location like Hong Kong or Amsterdam. If they start trying to "redeploy" to Ulan Bator it's time to worry. Have I mentioned I'm a sucker for airship stories? A group of Swiss researchers want to buld a swimming blimp -- an airship which would move through the air by undulating its body. It isn't as loopy as it sounds -- air and water are both fluids, after all, and the same rules for moving through a fluid apply to both. Certainly a swimming blimp would have some advantages: it would be quiet -- much quieter than modern airships with twin aircraft engines roaring away in outboard pods. An absence of metal engines and spinning propellors would also make them very hard to spot using radar. And finally, a swimming blimp would just look awesome. The big issue would appear to be weight. Fish swim in water and stay neutrally buoyant because muscle isn't all that much more dense than seawater -- especially with fat deposits and air chambers to make up the difference. So fish can be almost entirely muscle. Air is a lot less dense than water, so blimps and other airships have to include large volumes of lifting gas to float. Large large volumes: about 14 cubic feet per pound of weight. That means a balloon capable of carrying a single person must be a good 20 feet in diameter. Trouble is, that doesn't leave much room for muscles (or a mechanical analogue) to make the things swim. The electroactive polymers referenced in the New Scientist article sound promising, but it's noteworthy that so far all they've been used for in the test model is steering -- controlling the little fins at the back, not thrashing the whole body from side to side. Even the article notes that electroactive polymer muscles failed to defeat a high-school girl at arm-wrestling in 2005. It's likely to be some time before a swimming blimp is possible at all, and a very long time before the efficiency of aerial swimming can rival the time-tested rotary propellor. If ever. So if you look up in the next few months and see something swimming by, you're probably hallucinating. Could I Be… A Science Scout? Over the past few weeks, I’ve been getting links to the Science Scouts from different friends and acquaintances. I think they thought it was funny – after all, I’m a working scientist, I write on this blog, and I’m already a Girl Scout. What they don’t realize is that I’ve already earned a metric buttload of their badges. You can see some of them below the fold. The first Games Expo begins today in Las Vegas, and Zygote Games is there. We'll be giving demonstrations of both Bone Wars: The Game of Ruthless Paleontology and our upcoming summer release Parasites Unleashed. We're giving away parasite tattoos -- so if you're going to be there, swing by our booth in the GameTown area. It’s Friday. It’s time to look at a parasite. It’s also PZ Myers’ birthday. So what could be better than an cephalopod parasite in his honor? This is Anilocra physodes. 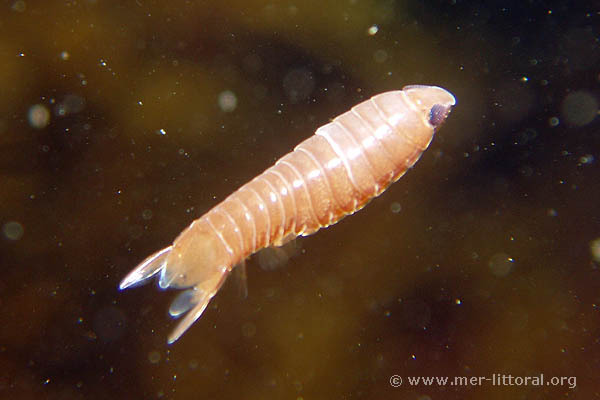 It's a parasitic isopod. It’s usually an ectoparasite of fish, much like sea lice, but it’s also found inside the mantle cavity of European squid. Must be itchy. Source: Gestal, C., P. Belcarf, E. Abollo and S. Pascual 1999. Parasites of cephalopods in the northern Tyrrhenian Sea (western Mediterranean): new host records and host specificity. Sci. Mar. 63: 39-43. A team of marine archaeologists in North Carolina believe they've discovered the wreck of Blackbeard's flagship, the Queen Anne's Revenge. Blackbeard, who was named Edward (or Edmund) Teach (or Thatch), was the most cinematic of all the real pirates who preyed on shipping in American waters. He wasn't around for the real Golden Age of piracy in the 17th century; Blackbeard's career began around 1716 (according to Daniel Defoe's General History of the Pyrates, still the best book about piracy), and ended in late 1718, so his enduring reputation comes from only two years' work. Blackbeard was apparently a shrewd fellow who understood the value of psychological warfare, for when boarding ships he would wear burning fuses in his hat and generally carry on like a complete homicidal maniac -- which of course encouraged ships to surrender without a fight. This mushroom coral has a tenant. 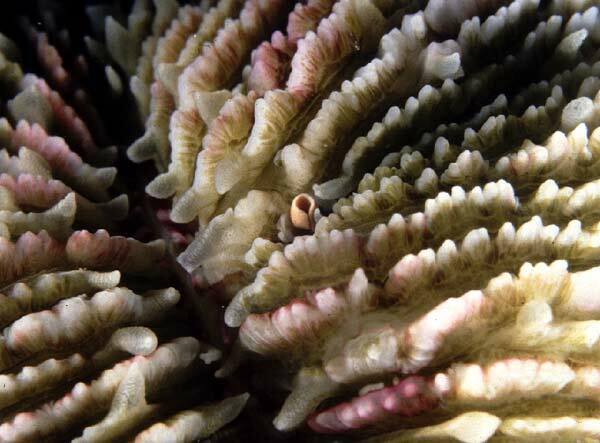 There's a tiny siphon peeking out through its polyps. It belongs to a marine snail called Leptoconchus, which spends its entire adult life inside a snail-sized cavity in the coral’s skeleton. A coral doesn’t leave gaps in its calcium carbonate skeleton that a snail can squeeze into, so larval Leptoconchus bore their own way in. Once they’ve dug out their cavelike home, you need a hammer to get them out again.